Are you among those using your mobile phones while on flights? You may continue to do so unless you are on board a Cebu Pacific flight using a Samsung Galaxy Note 7 device. Just today, Cebu Pacific Air issued advisory to all passengers of the budget airline that usage and charging of Samsung Galaxy Note 7 devices when on board a Cebu Pacific carrier is prohibited effective today, September 11, 2016 until further notice. The advisory is done as a safety measure in light of the recall of Galaxy Note 7 devices by Samsung due to safety issues. Per Cebu Pacific advisory, Samsung Galaxy Note 7 devices are not also allowed to be stacked in checked baggage. The devices can be hand carried as long as it is turned off at all times inside the aircraft. The management of Cebu Pacific hope for the full cooperation of all passengers. They say that the safety of all passengers on board their aircraft is their top most priority. Since last week, Samsung has been pulling out Galaxy Note 7 devices in the United States, South Korea and 8 other countries due to confirmed episodes of device explosions. 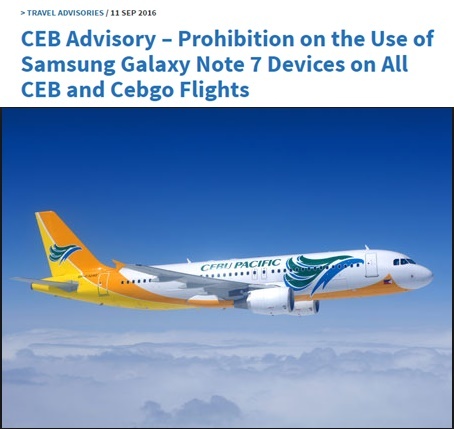 The Samsung Galaxy Note 7 ban holds thru on all CEB and Cebgo flights. For more travel news and updates, Promo fares and Piso Fares, LIKE and FOLLOW PISO FARE TICKETS in Facebook!! !